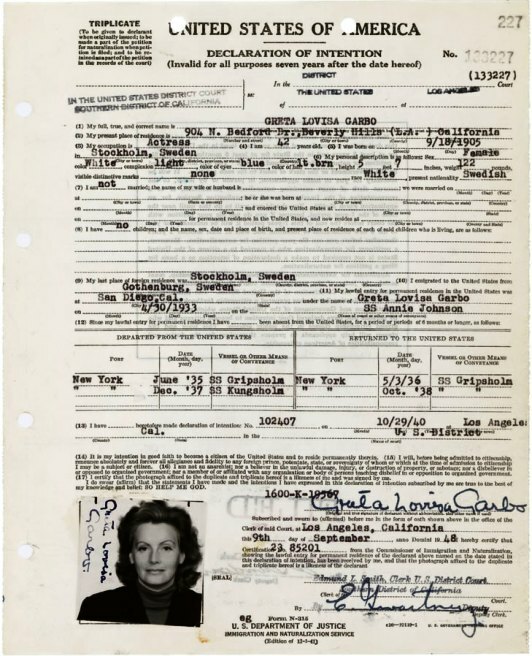 Declaration of Intention for Greta Garbo, stating that she wishes to become a United States citizen, September 9, 1949. — Records of District Courts of the United Courts of the United States, Record Group 21. Between 1917 and 1941, Hollywood studios, gossip columnists and novelist featured an unprecedented number of homosexuals, cross-dressers, and adulterers in their depictions of the glamorous Hollywood lifestyle. “In Hollywood Bohemians, Brett Abrams has provided all film historians with a brand new take on Hollywood. This social study should be must reading for all scholars. Rather than simplistic assertions, Abrams offers documents that will be new to all.” — Douglas Gomery, Professor of Journalism and Film Studies Emeritus, University of Maryland and author of Shared Pleases: A History of Movie Presentation In the United States and the Hollywood Studio System: A History. Brett L. Abrams is an archivist with the National Archives and Records Administration.